More than 32 students were left out of Martha Mendoza’s Newswriting Workshop in winter 2003. Those students didn’t just miss out on taking a course with the first UC Santa Cruz graduate with an independent major in journalism and a Pulitzer Prize-winning Associated Press journalist. Being left out of that class meant missing out on something greater. “We knew that whoever got into that class would get a journalism degree, and those who didn’t wouldn’t be able to join the minor,” recalled Erika French-Arnold, who was grateful to earn a spot in that class and graduated with a journalism minor in 2005. Over the span of 20 years, Conn Hallinan, Paul Skenazy and Roz Spafford founded a journalism minor grounded in UCSC’s writing program. From 1991-2005, the program awarded 223 minors. Prior to 1991, over 75 students graduated with independent majors in journalism. It took two rounds of budget cuts, one dean of humanities influencing central administration and less than three years for the entire program to crumble. 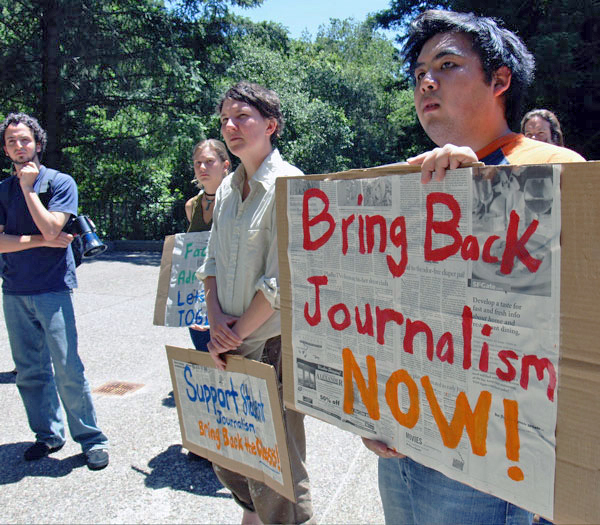 In 2001-02, the UC system faced over $240 million in budget cuts and the journalism minor was quickly targeted as one program to eliminate, though it cost less than $55,000 to maintain. The division of humanities operated on a $14,693,856 budget that year. 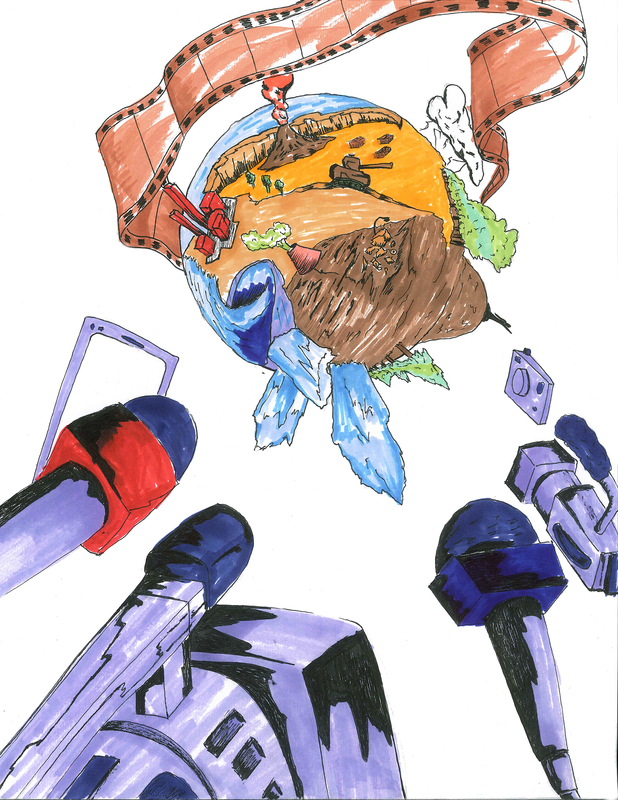 In 1998, City on a Hill Press (CHP) staff and its annual summer magazine, Primer, earned nine Gold Circle Awards in the Columbia Scholastic Press Association’s national contest sponsored by the Columbia School of Journalism. Primer earned “best all-around annual student magazine” and CHP earned second place in “best all-around non-daily newspaper” in the regional rankings in the Mark of Excellence contest sponsored by the Society of Professional Journalists. But when former Dean of Humanities Wlad Godzich had to respond to the 2001-02 budget cuts, it was unclear whether the journalism minor would survive. The humanities division also faced budget cuts four years prior in 1997. The UC suffered a $433 million loss in state funding from 1990-95. Despite the cuts, Freeman negotiated with Jorge Hankamer, the dean of humanities from 1995-2000, to keep the journalism minor in place. Hankamer said the minor attracted students to the university and the humanities division. Hankamer made clear there were certain parts of the humanities division that he did have to cut — old wounds he didn’t want to open back up. He said while deans face these kinds of decisions on a regular basis, they have the authority to save programs they value. Godzich was appointed dean of humanities in July 2000. He joined the UC system directly from the University of Geneva in Switzerland, where he was professor of English and comparative literature, chair of the Emergent Literatures program and a professor in the university’s Graduate Institute of European Studies. 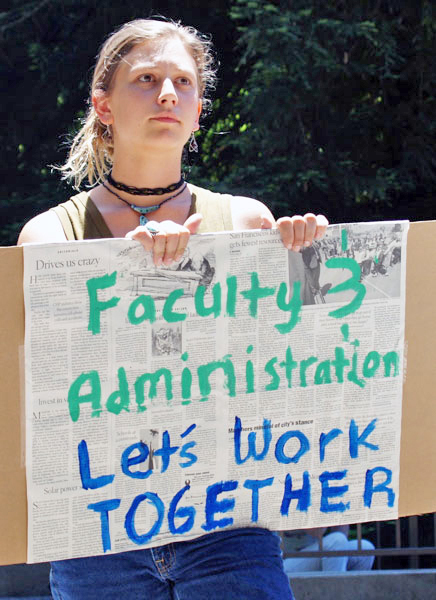 Godzich, who still teaches at UCSC, is an esteemed faculty member in the humanities division. He did just that. That October, Godzich committed $60,000 per year from 2000-03 to support a distinguished lecturer series for the Institute of Humanities Research (IHR). The IHR, established in 1999, was created to support humanities faculty, graduate student research and academic programming. Yet in March 2003, when he gave the writing program faculty its budget, there was no room for the journalism minor despite student interest. In Godzich’s Long Range Plan of the Division of Humanities Executive Summary in March 2001, he projected the journalism minor to grow by one-third its size by 2010-11. “The central administration [was] firm on its budget line and would not give any more money to fund journalism,” Godzich said. Carol Freeman, former chair of the writing program, strongly disagrees with that analysis. Chancellor George Blumenthal, who served as chair of Academic Senate from 2004-5, said that the minor’s academic program reviews were exceptional and never heard anyone say it wasn’t an outstanding program. “For me to say that meant [the members of the academic program review] were using words like ‘this is one of the best in the country,’ ‘a jewel in the crown,’” he said. Blumenthal also recalls the Academic Senate’s lack of involvement in the decisions that led up to the cut of the minor. He called it a process issue, and as much as he advocated for a full senate consultation of the cut, it never happened. The writing program had enough money left over to get all students already in the journalism minor graduated by 2005. But the minor, and its students, didn’t go quietly. Over 200 students held a protest outside of McHenry Library while others gathered hundreds of petition signatures to support the minor. Later in the year, students managed to pass Measure 13, the Student Media Council Fee, which supports equipment, software and facility improvements for campus Student Media organizations. Without it, Student Media couldn’t operate. Sherr also prolonged the cut of the minor by declaring the independent major, which forced the university to offer classes to fit the major and thus, the minor. “That was my subtle piece of protest,” Sherr said. Carol Freeman said despite Godzich’s administrative position, he was not the sole figure for the minor’s defunding. “He was the person we concentrated our anger at, but I don’t think it could’ve happened unless the [Executive Vice Chancellor John Simpson] and Chancellor [M.R.C. Greenwood] were willing to let it happen too,” Freeman said. With its origins in the writing program, Roz Spafford, one of the founders of the journalism minor, argues the minor took an unconventional approach to journalism as more than solely a skill set. She said most journalism programs don’t have a connection with a writing program. As a Ph.D. graduate of Columbia University, which has a top-ranked journalism program, Godzich had a different expectation of what a journalism program should be. He referenced San Francisco State University as an ideal program because of its broad take on print and multimedia journalism, along with opportunities for students to get published in local publications. Godzich felt UCSC’s journalism curriculum was a “fly-by-night operation” and fell short as a program because journalism students should learn how to interview people, how to cultivate sources and how to research stories — skills he believed were not taught at UCSC courses. But Conn Hallinan, journalism instructor and CHP advisor, said while those skills are important and taught in introductory classes, they were far from the main objectives in his teaching and advising of CHP. The minor wasn’t serving as a vocational or professional degree, rather a complement to students’ majors. Godzich, however, argues this could easily be accomplished in college core courses that focus on social justice. Former journalism students like Erika French-Arnold, who was a literature major, said the minor’s classes helped her become a better writer overall. Godzich remains firm that journalism is best suited as a professional, graduate program. Still, alumni like Ian Sherr hold the award-winning program and the skills it taught in high regard. Sherr is the west coast executive editor at CNET News and former reporter for the Wall Street Journal. “Martha Mendoza got people jailed and saved thousands of people from slavery,” Sherr said, referencing Mendoza’s most recent Pulitzer Prize for Public Service. Mendoza earned the award with the Associated Press after an international investigation of the fishing industry in Southeast Asia that freed over 2,000 slaves and traced the seafood they caught to supermarkets and pet food providers across the U.S. Despite the university phasing journalism out, CHP and Student Media live on. It survived potential budget cuts of Student Organization Advising and Resources (SOAR) and the layoff of the director of Student Media in 2009. Students continue to organize, fight back and see journalism as more than a vocation, but a means to critique the world around them.